The document titled “draft statement by Vincent Bergin” and dated November 1, 2010, was circulated to a number of people in the ODCE, including Mr O’Connell and his then boss, Paul Appleby, the director of corporate enforcement. These people suggested changes to the document and Mr O’Connell said he then distilled or synthesised “the shared viewpoint” that was finally settled on. The jury was shown various versions of the document with new sections inserted, other sections crossed out or deleted, and others marked with the words “drop” or “delete”. Bernard Condon SC, defending, compared the process of producing the statement to the “hokey cokey”. Mr O’Connell agreed the process was wrong and inappropriate. Mr Condon told the court that rulings by Judge Mary Ellen Ring during the first trial in May 2015 and by Judge John Aylmer during the current trial found that it was an unlawful practice. He said it was unlawful because it meant the jury never get to hear what the witness might have said in an unvarnished statement and not produced after they had being coached. Mr O’Connell said he couldn’t quibble with counsel’s characterisation of one particular ODCE insertion as “outrageous” . The paragraph states: “I regard the letter of representation in any audit as a statement made to us…which conveys information…which we require under the Companies Act”. Counsel said the exact wording ended up in the final statements of EY auditors Mr Bergin and Kieran Kelly. “It comes out of the mouth of the ODCE and is put into the mouth of Vincent Bergin. It is wrong, wrong, wrong,” he said. Both Mr Bergin and Mr Kelly are due to give evidence later in the trial. 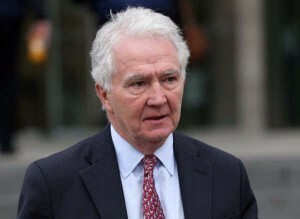 Mr O’Connell said he accepted now that the process was wrong but said it was his honestly-held belief at the time that the final statements represented the considered view of both witnesses. Counsel submitted that this comment was contrary to the duty of an investigator to seek out evidence as to the innocence as well as guilt of suspects. Mr O’Connell agreed that it was a wrong thing to say and he regretted that he did not know this at the time and did not object to it when it was said. Another comment attributed to Mr Appleby states: “I don’t think we should suggest an answer. Mr Bergin may wish to withdraw the statement or revise it, which would suit us better”. Mr Condon said this comment was not indicative of an impartial investigation. “It’s quite wrong for Mr Appleby to take this out because you might get a better answer,” counsel submitted. Mr O’Connell agreed. “There are serious dangers in telling people what to say and in writing it for them. This is a person’s statement, presented to the defence as the statement of Vincent Bergin. This is a statement, the wording of which is a product of you and Paul Appleby and others in the ODCE and unknown people in the EY and A&L Goodbody [lawyers for EY],” Mr Condon said.